Why not "The Blandings Build Their Dream House?" 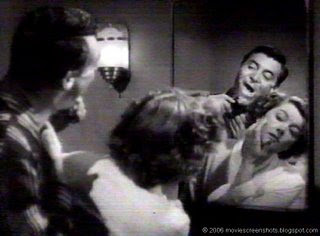 Jim and Muriel Blandings (Cary Grant and Myrna Loy) and their two daughters (one precocious) start out the movie living in a cramped little apartment in New York. Muriel has secret grand plans to knock down walls and transform their apartment. Jim would love a closet that holds all his things and then closes. When Jim comes across a real estate ad for a house in the country, he and Muriel instantly fall in love with the place and buy it, only to learn that it will need to be entirely knocked down and rebuilt. They spend most of the movie driving their architect crazy with elaborate plans for too many bathrooms and closets and all of the things they never would have dreamed of having in the city. And, the house is just as much Muriel's dream as it is Jim's!!! So, I repeat, why not "The Blandings Build Their Dream House?" *Cary Grant shower scenes... In this movie he sings "Home on the Range." In "Charade" he seems to be humming "Singin' in the Rain" while he showers in his clothes. I'm pretty sure he was also humming "Singin' in the Rain" when he pretended to take a shower in "North by Northwest." Fascinating. 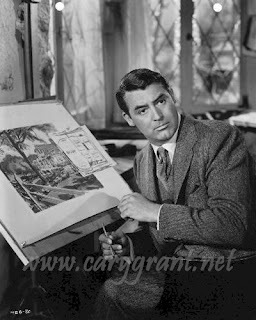 I am quite the Cary Grant character historian... When I explained this exciting discovery to my friend Barbara she said, "So this is the only movie where he takes an actual naked shower." *wow, I've seen enough classic movies to know things about the 30s and 40s... Without having seen "The Women," I never would have gotten the joke, "When I came in here this morning, I had no intention of sending you two to Reno." *Hey, there is a good quote in this movie... Muriel on why she fell for Jim: "Maybe it was those big cow eyes of yours or that ridiculous hole in your chin." *When will this movie end? This was one of the first movies I Tivoed from TCM...and I remember it as awful for one main reason - it is the hapless Mr. Blandings that drives himself nearly to insanity in his quest for his dream. Yes it's his wife's dream, too, but she seems somehow blissfully insulated from the burgeoning insanity that threatens to push him over the edge. That puts this movie squarely in the territory of "man slowly going insane due to unusual circumstances while you watch helplessly" one of my least favorite. I think it also helped that I was just done buying my own "dream house" and nearly killing my spouse in the process of moving was a little close to home. Also, real estate was CHEAP in the thirties in Connecticut! I have argued that Spencer Tracy would have been a better choice for the male lead. I invite any alternate views.